Viv is not the only company competing for a share of those billions. The field of artificial intelligence has become the scene of a frantic corporate arms race, with Internet giants snapping up AI startups and talent. Google recently paid a reported $500 million for the UK deep-learning company DeepMind and has lured AI legends Geoffrey Hinton and Ray Kurzweil to its headquarters in Mountain View, California. Facebook has its own deep-learning group, led by prize hire Yann LeCun from New York University. Their goal is to build a new generation of AI that can process massive troves of data to predict and fulfill our desires. Viv strives to be the first consumer-friendly assistant that truly achieves that promise. It wants to be not only blindingly smart and infinitely flexible but omnipresent. Viv’s creators hope that some day soon it will be embedded in a plethora of Internet-connected everyday objects. 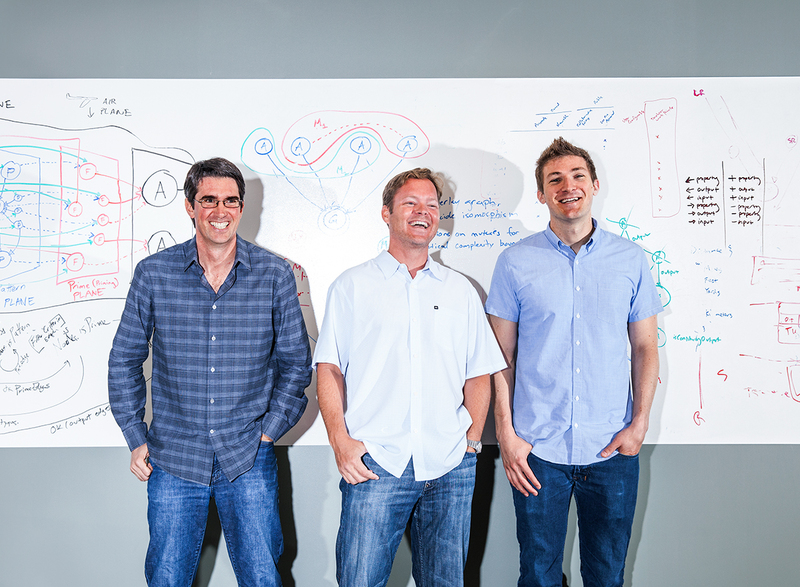 Viv founders say you’ll access its artificial intelligence as a utility, the way you draw on electricity. Simply by speaking, you will connect to what they are calling “a global brain.” And that brain can help power a million different apps and devices. Viv labs is tucked behind an unmarked door on a middle floor of a generic glass office building in downtown San Jose. Visitors enter into a small suite and walk past a pool table to get to the single conference room, glimpsing on the way a handful of engineers staring into monitors on trestle tables. Once in the meeting room, Kittlaus—a product-whisperer whose career includes stints at Motorola and Apple—is usually the one to start things off. He acknowledges that an abundance of voice-navigated systems already exists. In addition to Siri, there is Google Now, which can anticipate some of your needs, alerting you, for example, that you should leave 15 minutes sooner for the airport because of traffic delays. Microsoft, which has been pursuing machine-learning techniques for decades, recently came out with a Siri-like system called Cortana. Amazon uses voice technology in its Fire TV product. Viv is an open system that will let innumerable businesses and applications become part of its boundless brain. The technical barriers are minimal, requiring brief “training” (in some cases, minutes) for Viv to understand the jargon of the specific topic. As Viv’s knowledge grows, so will its understanding; its creators have designed it based on three principles they call its “pillars”: It will be taught by the world, it will know more than it is taught, and it will learn something every day. As with other AI products, that teaching involves using sophisticated algorithms to interpret the language and behavior of people using the system—the more people use it, the smarter it gets. By knowing who its users are and which services they interact with, Viv can sift through that vast trove of data and find new ways to connect and manipulate the information. Kittlaus says the end result will be a digital assistant who knows what you want before you ask for it. He envisions someone unsteadily holding a phone to his mouth outside a dive bar at 2 am and saying, “I’m drunk.” Without any elaboration, Viv would contact the user’s preferred car service, dispatch it to the address where he’s half passed out, and direct the driver to take him home. No further consciousness required. He says he used the technique to land his early computing jobs, including the most significant—at SRI International, a Menlo Park think tank that invented the concept of computer windows and the mouse. It was there, in the early 2000s, that Cheyer led the engineering of a Darpa-backed AI effort to build “a humanlike system that could sense the world, understand it, reason about it, plan, communicate, and act.” The SRI-led team built what it called a Cognitive Assistant that Learns and Organizes, or CALO. They set some AI high-water marks, not least being the system’s ability to understand natural language. As the five-year program wound down, it was unclear what would happen next. That was when Kittlaus, who had quit his job at Motorola, showed up at SRI as an entrepreneur in residence. When he saw a CALO-related prototype, he told Cheyer he could definitely build a business from it, calling it the perfect complement to the just-released iPhone. In 2007, with SRI’s blessing, they licensed the technology for a startup, taking on a third cofounder, an AI expert named Tom Gruber, and eventually renaming the system Siri. The small team, which grew to include Chris Brigham, an engineer who had impressed Cheyer on CALO, moved to San Jose and worked for two years to get things right. “One of the hardest parts was the natural language understanding,” Cheyer says. Ultimately they had an iPhone app that could perform a host of interesting tasks—call a cab, book a table, get movie tickets—and carry on a conversation with brio. They released it publicly to users in February 2010. Three weeks later, Steve Jobs called. He wanted to buy the company. “I was shocked at how well he knew our app,” Cheyer says. At first they declined to sell, but Jobs persisted. His winning argument was that Apple could expose Siri to a far wider audience than a startup could reach. He promised to promote it as a key element on every iPhone. Apple bought the company in April 2010 for a reported $200 million. After several months, Kittlaus got back in touch with Cheyer and Brigham. They asked one another what they thought the world would be like in five years. As they drew ideas on a whiteboard in Kittlaus’ house, Brigham brought up the idea of a program that could put the things it knows together in new ways. As talks continued, they lit on the concept of a cloud-based intelligence, a global brain. “The only way to make this ubiquitous conversational assistant is to open it up to third parties to allow everyone to plug into it,” Brigham says. In retrospect, they were re-creating Siri as it might have evolved had Apple never bought it. Before the sale, Siri had partnered with around 45 services, from AllMenus.com to Yahoo; Apple had rolled Siri out with less than half a dozen. “Siri in 2014 is less capable than it was in 2010,” says Gary Morgenthaler, one of the funders of the original app. Cheyer and Brigham tapped experts in various AI and coding niches to fill out their small group. To produce some of the toughest parts—the architecture to allow Viv to understand language and write its own programs—they brought in Mark Gabel from the University of Texas at Dallas. Another key hire was David Gondek, one of the creators of IBM’S Watson. It’s early May, and Kittlaus is addressing the team at its weekly engineering meeting. “You can see the progress,” he tells the group, “see it get closer to the point where it just works.” Each engineer delineates the advances they’ve made and next steps. One explains how he has been refining Viv’s response to “Get me a ticket to the cheapest flight from SFO to Charles de Gaulle on July 2, with a return flight the following Monday.” In the past week, the engineer added an airplane-seating database. Using a laptop-based prototype of Viv that displays a virtual phone screen, he speaks into the microphone. Lufthansa Flight 455 fits the bill. “Seat 61G is available according to your preferences,” Viv replies, then purchases the seat using a credit card. Viv’s founders don’t see it as just one product tied to a hardware manufacturer. They see it as a service that can be licensed. They imagine that everyone from TV manufacturers and car companies to app developers will want to incorporate Viv’s AI, just as PC manufacturers once clamored to boast of their Intel microprocessors. They envision its icon joining the pantheon of familiar symbols like Power On, Wi-Fi, and Bluetooth. That would also be nice because it just might provide Viv with a business model. Kittlaus thinks Viv could be instrumental in what he calls “the referral economy.” He cites a factoid about Match.com that he learned from its CEO: The company arranges 50,000 dates a day. “What Match.com isn’t able to do is say, ‘Let me get you tickets for something. Would you like me to book a table? Do you want me to send Uber to pick her up? Do you want me to have flowers sent to the table?’” Viv could provide all those services—in exchange for a cut of the transactions that resulted. Indeed, many things have to go right for Viv to make good on its founders’ promises. It has to prove that its code-making skills can scale to include petabytes of data. It has to continually get smarter through omnivorous learning. It has to win users despite not having a preexisting base like Google and Apple have. It has to lure developers who are already stressed adapting their wares to multiple platforms. And it has to be as seductive as Scarlett Johansson in Her so that people are comfortable sharing their personal information with a robot that might become one of the most important forces in their lives. The inventors of Siri are confident that their next creation will eclipse the first. But whether and when that will happen is a question that even Viv herself cannot answer. Yet. Dieser Eintrag wurde veröffentlicht in Innovation, Innovatoren und getaggt mit Adam Cheyer, Apple, Siri am 17. August 2014 von innovation. 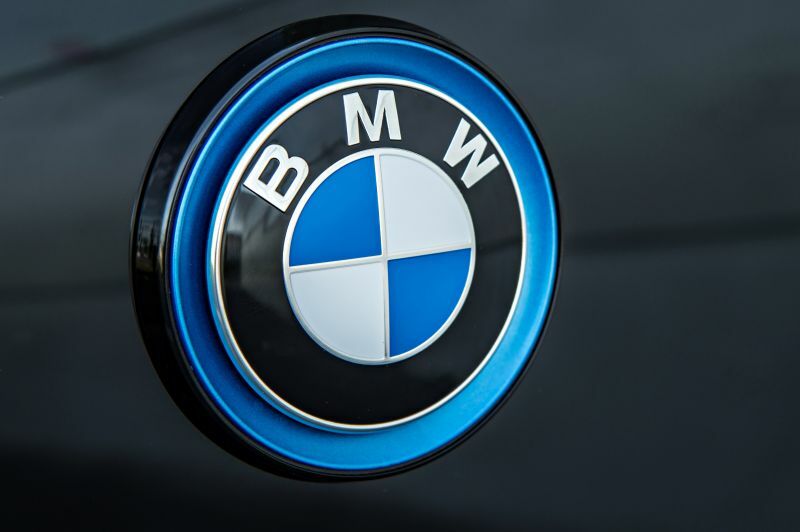 Dieser Eintrag wurde veröffentlicht in Mobility und getaggt mit Audi, BMW, Mercedes am 6. August 2014 von innovation. Im Ranking der weltweiten Top 5 der größten Smartphone-Hersteller müssen Samsung und Apple einige Marktanteile an die Konkurrenz von Lenovo und LG Electronics abgeben. Der große Gewinner beim globalen Absatzvolumen heißt Huawei. Die Chinesen jagen Apple und Samsung im Geschäft mit Smartphones deutlich Marktanteile ab. Laut den neuesten Zahlen der Marktanalysten von IDC für das vergangene Quartal Q2/2014 bröckelte der Marktanteil des weltweit größten Herstellers Samsung von 32,3 Prozent in Q2/2013 auf nun 25,2 %. Gleichzeitig verkaufte Samsung mit 74,3 Millionen Smartphones um fast 4 Prozent weniger Phones, als im Vergleichszeitraum des Vorjahres (77,3 Mio.). Insgesamt wurden weltweit im 2. 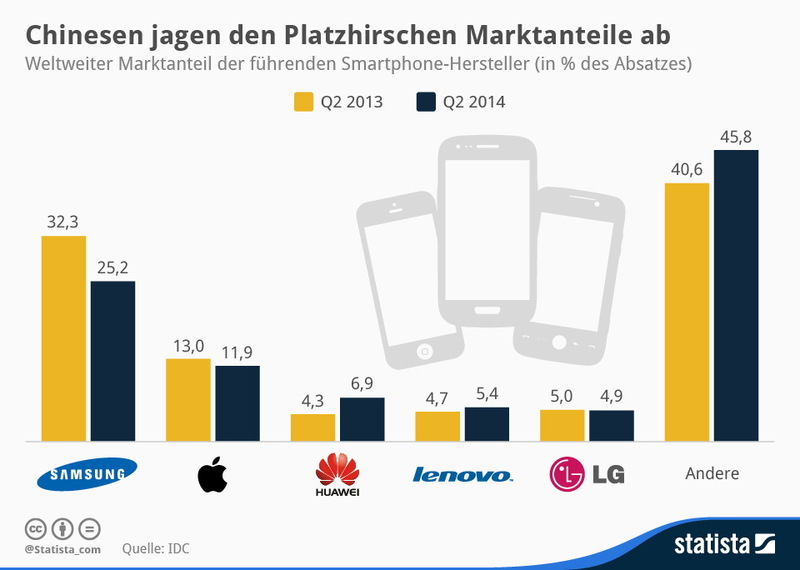 Quartal 2014 fast 300 Millionen Smartphones ausgeliefert. Das ist ein Plus von 23,1 Prozent (Q2/2013: 240 Mio.). Apple behauptet sich im globalen Ranking der Top 5 der weltweit größten Smartphone-Hersteller mit 35,1 Millionen iPhone Smartphones auf Platz 2 und steigerte damit sein Absatzvolumen um 12,4 Prozent (Q2/2013: 31,2 Mio.). Beim Marktanteil verliert Apple aber 1,1 Prozent und hält jetzt statt 13 Prozent noch 11,9 %. Der große Gewinner im Ranking heißt Huawei. Der chinesische Telekommunikationsriese steigerte sein globales Liefervolumen um 95,1 Prozent, von 10,4 Millionen Smartphones auf 20,3 Mio. Geräte: Platz 3. Der Marktanteil von Huawei beträgt jetzt 6,9 Prozent (Q2/2013: 4,3 %). Auch für Lenovo auf Rang 4 lief das 2.Quartal 2014 gut: Absatzsteigerung um 38,7 Prozent von 11,4 auf 15,8 Millionen Phones und 5,4 Prozent Marktanteil (zuvor 4,7 %). Für den südkoreanischen LG Electronics Konzern bleibt mit 14,5 Millionen (Q2/2013: 12,1 Mio.) und einem Marktanteil von nun 4,9 Prozent (Q2/2013: 5 %) Position 5. Die Verkäufe für das neue und sehr populäre Smartphone-Flaggschiff LG G3 werden sich IDC zufolge erst im 3. Quartal in den Absatzzahlen widerspiegeln. Dieser Eintrag wurde veröffentlicht in Gadgets und getaggt mit Apple, google+, Herstellers Samsung, Huawei, IDC, Lenovo, LG, LG Electronics, Prozent Marktanteil, samsung, Smartphone am 6. August 2014 von innovation.